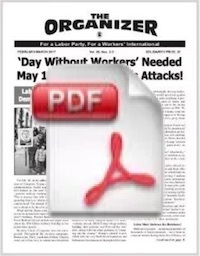 On June 10, 2013, the San Francisco Labor Council adopted a resolution on “Building an Independent Labor Movement” that was submitted for a discussion and vote at the 2013 National AFL-CIO Convention in Los Angeles. “Whereas, we are an independent labor movement and as such should never subordinate the interests and needs of the working class to the dictates of politicians of either major party, as these politicians all too often defer to the corporate class. Does this not apply to all too many arenas of our activity as a labor movement — from the bailouts of Wall Street and Detroit, to healthcare reform, to the fight for jobs for all, or even most recently to immigration reform? Wall Street was bailed out to the tune of $12 trillion, while Main Street got shafted. GM and Chrysler received $90 billion in bailout funds, while UAW members, in the name of “shared sacrifice,” were forced to take major cuts in jobs, wages, and pension and healthcare benefits for retirees. Now the automakers’ profits are way up, but Detroit is bankrupt, and the government is refusing to bail out Detroit’s public workers, who risk losing their pensions. Shouldn’t the labor movement, following the example of the San Francisco Labor Council, demand, “Bail Out Main Street, NOT Wall Street?” Shouldn’t labor demand that the government provide the $3.5 billion it would take to make the workers’ pension fund whole to ensure them the retirement security they deserve and are owed. Later, labor was told that the Affordable Care Act was the only thing on the healthcare reform table. Instead of fighting and campaigning for what we want and need, Single Payer healthcare / Medicare For All, labor dropped the ball. Now we are saddled with a corporate reform that keeps the private insurance companies in the driver’s seat and threatens our union health-care plans. We may not have won Single Payer, but by sticking to our guns we could have won the Public Option, salvaged our union plans, and opened the door to Single Payer. Then we were told to go along with the Obama plan on “job creation” — which would provide at most 2 million new jobs — at a time when unemployment and underemployment are at 27 million. Shouldn’t the labor movement, instead, be fighting independently for its own full employment program? And now we are being told to rally behind the Senate’s Comprehensive Immigration Reform bill as a way to win a path to citizenship for up to 11 million undocumented immigrants. This is a bill that would exclude more than half of the applicants for citizenship over the 13-year application process, increase the militarization of the border by $45 billion, heighten the repression of undocumented workers on the shop floor (E-Verify, employer sanctions) and maintain a slightly revised, but no-less objectionable, “guest worker” program. These are all points that labor has strongly opposed in the past. 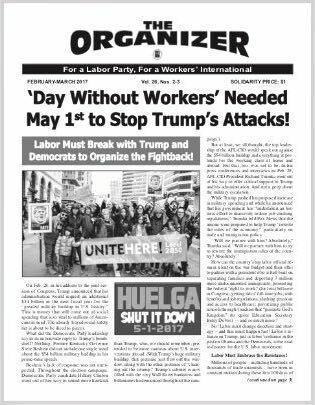 We call on all convention delegates to push for a full discussion of this San Francisco Labor Council resolution on the convention floor. The issues raised here cannot and must not be brushed aside. They are too crucial to our future as a labor movement!